One of the lovely things about NASA is that you can poke around the raw images taken by their robot explorers. 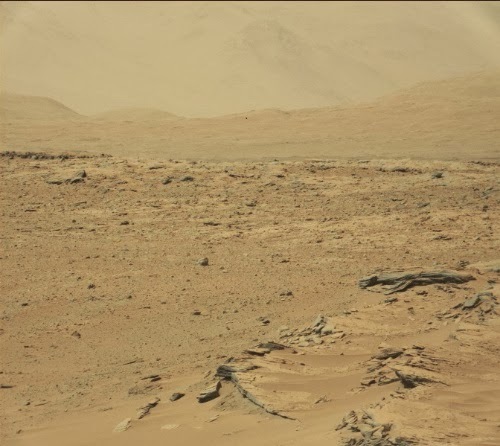 The image above was taken by the mastcam of the Curiosity Mars rover on the February 23rd. It shows layered rocks weathering out amongst flows of sand in the foreground, the long arc of a ridge with low hills beyond, and in the background, hazed by the dusty atmosphere, the flank of Mt. Sharp, Curiosity's ultimate destination (the original is here - click to embiggen). It's a composition as beautiful as a Chesley Bonestell painting, lacking only a couple of astronauts hunting for fossils in some long-dry stream bed. You want to walk out into it, kicking rocks as you go.